Situated near the beach, this motel is within a 15-minute walk of Ulverstone History Museum, Ulverstone Visitor Information Centre, and Shropshire Park. Dial Range Forest Reserve and Penguin Undercover Market are also within 12 mi (20 km). Ulverstone West Station is 25 minutes by foot. Situated near the beach, this cabin is within a 15-minute walk of Ulverstone History Museum, Shropshire Park, and Ulverstone Visitor Information Centre. Dial Range Forest Reserve and Penguin Undercover Market are also within 9 mi (15 km). Ulverstone West Station is 24 minutes by foot. Situated near the beach, this hotel is within a 10-minute walk of Ulverstone Visitor Information Centre, Ulverstone History Museum, and Shropshire Park. Dial Range Forest Reserve and Penguin Undercover Market are also within 9 mi (15 km). Ulverstone West Station is 13 minutes by foot. 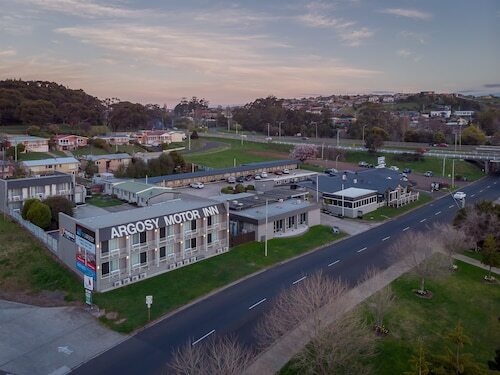 Located in the heart of Ulverstone, this motel is within 1 mi (2 km) of Ulverstone History Museum, Ulverstone Visitor Information Centre, and Shropshire Park. Dial Range Forest Reserve and Don River Railway are also within 9 mi (15 km). Ulverstone West Station is 29 minutes by foot. Take a break in north-west Tasmania with one of these Ulverstone/Penguin hotels. 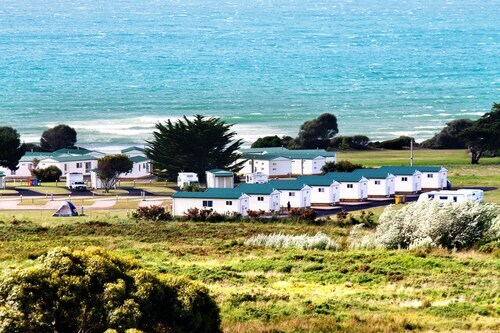 You’ll enjoy views of the Bass Strait coastline, the Leven River and so much more. Your first stop in Ulverstone should definitely be The Big Penguin, one of Tasmania's most photographed landmarks. Once you've taken some pictures, you can head to the Ulverstone History Museum to learn more about the town's heritage. The displays feature artefacts and photographs, which depict the lives of the town's early pioneers. From there, you can move on to the Ulverstone Visitor Centre Gallery, which displays works of art from local artists. Another sight worth snapping a few photos of is the Dutch Windmill in Hiscutt Park. In spring, the windmill even has tulips around it! If flowers are your thing, make sure you also visit Kaydale Lodge Gardens, which has beautiful daffodils and peonies that bloom in spring, as well as maples in autumn. Nature lovers won't be disappointed in Penguin. Dial Range is great for bushwalking, mountain biking or horse riding and Leven River is good for trout fishing, kayaking and swimming. There are also beautiful picnic spots along the river, as well as barbeque facilities, parklands and play areas. If you take a cruise along the river, you might even spot a platypus or two playing in the water. Those keen on spelunking can check out the glow worms on a Gunns Plains cave tour. There are more than fifty caves, in total, and the world's largest freshwater lobsters live down in the caves' streams. If you're in need of some retail therapy while you're in town, there are plenty of antique stores. Ellis House is the most popular store and was built in 1888. There's also an antique bookstore, which stocks collections of books up to 500 years old. If you're here on a Sunday, drop by the Penguin Market, which features more than 200 stalls selling fresh produce and handcrafted goods. Here, you can pick up some regional wine as well as locally grown berries and cherries. The Ulverstone Heartbeat Car Boot Sale is also on every second Saturday of the month. Penguin is located between Devonport and Burnie, but the Devonport airport is slightly more convenient, being only 31km from Penguin. Check out these cheap flights to Devonport, while you're booking your Ulverstone/Penguin accommodation. While you're in the area, Latrobe is also worth a visit. It's especially famous for its Australia Day event, Henley-on-Mersey. Get ready for beautiful scenery, historic sights and relaxing times along the Leven River. Don't forget to book your cheap flights and accommodation today. How Much is a Hotel Room in Ulverstone? Hotels in Ulverstone start at AU$80 per night. Prices and availability subject to change. Additional terms may apply.